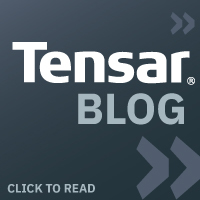 Home / Tensar Corp Blog / Get in, get out, and get the job done! Almost every contractor has faced this problem: you’re ready to go to work, but you can’t get onto the site because of poor site conditions or bad weather. The site is wet and sloppy, so you can’t start the job. Equipment and manpower downtime is costing you time and money while you wait for the site to dry. The result – additional costs and scheduling problems, especially if your equipment is needed elsewhere. You have options. You can over-excavate and import fill, but that is expensive. You can try to lay down a layer of fabric and aggregate fill to help you get onto the site, but if the soil is too soft, installation may be impossible. What do you do? There’s a better answer – Tensar® TriAx® Geogrids. Some sites are just too tough for fabrics to handle. Some areas where fabrics are used need so much maintenance after installation, or require such a large fill thickness, it hardly seems worth it to have used them in the first place. Plus, fabrics can be difficult to install. Who needs the hassle? Tensar TriAx Geogrids offer a better solution. When faced with the cost of losing equipment production time or wasting valuable man-hours, using TriAx Geogrids can be the best decision you make. Since they are easier to install, use less aggregate fill, and require no skilled labor or specialized equipment, TriAx Geogrids help you get in, get out, and get the job done on time. Tensar TriAx Geogrids help you get onto the site, even with bad weather or poor soil conditions. On sites you can barely walk on, simply roll out the geogrid and push out a layer of aggregate. Now you’ve got a firm, freedraining platform or a reliable access road. 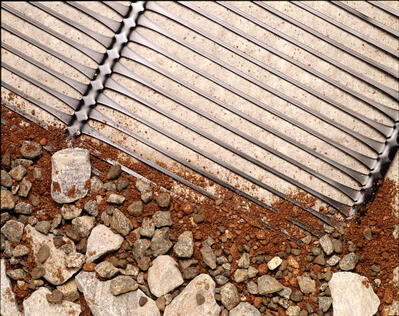 With TriAx Geogrids, bad sites and poor weather won’t be a challenge anymore. Removing bad soils is getting more and more expensive. Contaminated areas require special (and costly) disposal. Now you can work on top of weak soils by adding a layer of TriAx Geogrid and aggregate fill. The result – less undercutting, backfilling, and disposal costs. And don’t forget, Tensar International has the experience to help you determine the right fill thickness for your projects. In test after test, Tensar TriAx Geogrids have proven their value by enabling a thinner, stabilized aggregate fill layer to have the identical bearing capacity and serviceability as a thicker, unstabilized aggregate fill layer – or even a layer with a fabric under it. 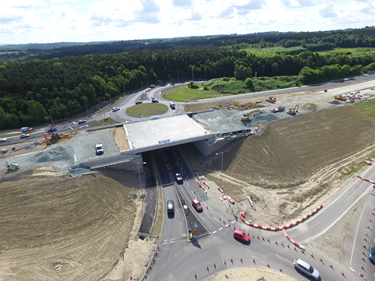 A reduction in aggregate thickness can be achieved through the use of TriAx Geogrids, with no change to the road’s performance. You can Value Engineer (VE) for profit by using TriAx Geogrids to construct thinner fill layers. 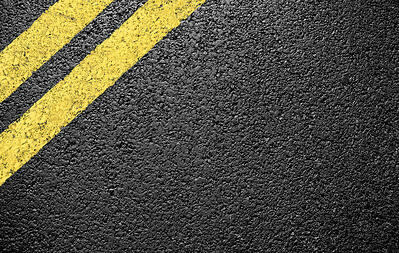 When curbs determine the final pavement grade or existing utilities limit undercutting, it is possible to construct a reliable but thinner base course without sacrificing durability and without expensive reconstruction or utility re-routing. To put it simply, for stabilizing aggregate, especially over weak subgrades, stiffer is better. TriAx Geogrids can help with fast-track projects and those with high costs associated with aggregate fill, over-excavation, or haul off. 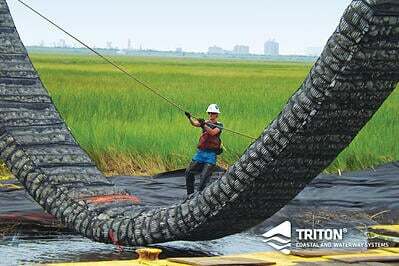 TriAx Geogrids have saved time and money on thousands of jobs. A key advantage is reliability. Once installed, the surface needs less maintenance than a surface underlain by fabric. On jobs across the U.S., access roads built with TriAx Geogrids have stood up to repeated passes of fully loaded haul trucks with little or no maintenance, even on sites where roads containing fabric had already failed. Our lightweight rolls are easy to handle and easy to cut in the field. They make it simple to adapt to curves and utility projections. The biggest advantage in installation – you can roll Tensar TriAx Geogrids out onto the subgrade and walk on them, even in the weakest soil conditions. Adjacent rolls of Tensar Geogrids normally don’t require any connection, since aggregate fill simultaneously interlocks with overlapping geogrid apertures. A simple overlap is sufficient and no sewing is required. Download our handy subgrade improvement pocket card to see how using TriAx geogrid helps reduce cut/fill requirements and improve job site subgrade conditions. If you're not using TriAx Geogrid to stabilize soft soils on your site, then you could potentially be missing out on thousands in cost savings and adding time to your construction schedule. Savings this significant is worth another look. Request a complimentary project review from Tensar and you could easily add time and cost savings to your bottom line. *And project reviewed before April 30, 2019 are entered to win $1,000 as part of our Project Review Contest.